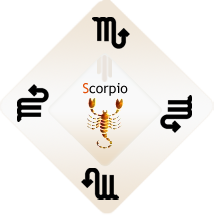 Scorpio is an emotional, fiery water sign, usually represented by a creature of the desert — the scorpion. But it’s a desert creature that resembles lots of critters that live underwater, as if the ocean dried out and the scorpion stayed behind. Note the contradictions: fiery water, ruled by a land creature. Of all the animals to have as your totem, the scorpion is by far the oddest of the lot, and we can be sure that the ancient masters of lore had a perverse sense of humor, or were keenly aware of human nature.